Acts like The 1975 and Catfish and the Bottlemen have enjoyed well-documented sharp inclines in terms of success in the past few years, so much so that they’ve become practically inescapable. Bastille may not have followed that exact blueprint, but they’ve modestly become a household name thanks to smash debut album Bad Blood and hit single Pompeii. As the release date to second album Wild World drew closer, it became clearer that this success was a double-edged sword. Would Wild World live up to Bad Blood’s legacy? It may not propel Bastille to the same heights as their debut did, but it’s a reminder that they are one of the most important pop acts out there. The main reason behind this is the experimentation at the core of Bastille’s sound. On Wild World, they truly show how they’re not just willing to think outside the box, they’re willing to leap and bound outside it. Electric guitar and hip-hop beats are mixed together on Power, oriental strings and vocal samples on Glory, and marimbas utilised heavily in Good Grief, to name but a few. Most tracks on here could have pages and pages written about their musical diversity and how they inexplicably pay off – An Act Of Kindness has a beautiful sense of doom surrounding it, while Send Them Off!’s brilliant brass hook will have you wondering why more pop acts don’t throw trombones into their future chart-toppers. This plus Dan Smith’s always stunning delivery of their trademark poetic lyrics (taking inspiration from mythology, cult media, and real-life morality) and knack for writing stadium-alighting choruses make this material some of the most unique and distinctive in the market right now. Of course it doesn’t always pay off – Four Walls (The Ballad of Perry Smith) can only be described as drab and plodding while Fake It lacks anything particularly individual and is pretty lifeless as a result. On top of that, the album is plagued by film snippets that don’t really tie into the album tracks – at least not obviously, anyway. While the central ideas to Bastille’s work are still firmly in place, this is not the same band who released Bad Blood. They seem to care less about outward perceptions of their band – both in terms of experimentation and polish. Bad Blood gave Dan Smith plenty of opportunities to showcase his voice with instrumentally sparse ballads – Wild World only really has one of these instances (the gorgeous Two Evils), but something about his vocals seems rougher around the edges this time around. There are a lot more cracks in his falsettos, and it adds a vulnerability to the overall effect. On the other side, though, Bastille as a whole have strengthened lyrically. There are a lot more confrontational cases on Wild World. Power practically slaps you in the face with forceful electric guitars and general hostility (“if you’re gonna hit me, hit me harder / ‘Cause you’d better knock me out the first time”), while The Currents, which details frustration at bigots really speaks for itself (“I can’t believe the scary points you make…won’t you stop firing up the crazies?”). Considering Bastille tend to keep their minds firmly in fantasy when writing lyrics, it’s certainly a welcome change. The doubts surrounding Wild World may have been more than justified, but honestly, Bastille have more than stepped up to the mark. There’s no audible attempt to replicate anything from Bad Blood (except for Snakes which has more than a whiff of Laura Palmer about it) – something most bands who’ve had the success Bastille have wouldn’t have thought twice about doing. Wild World is bold and fearless while still maintaining a wide-eyed humbleness about it, and surely the fact that nine of the fourteen tracks pass before we hit a dud says something. The music industry needs an act like Bastille, and something about Wild World gives the impression that they’re only scratching the surface at what they can do. 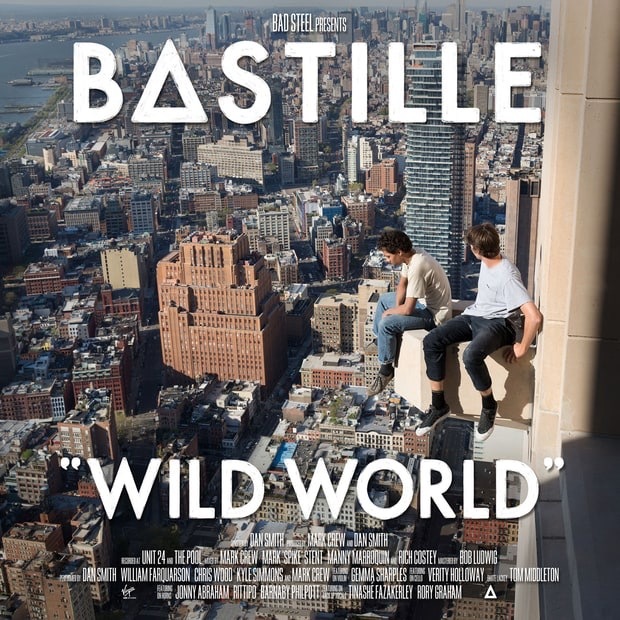 ‘Wild World’ by Bastille is out now on Virgin Records.